How did anyone plan parties without pinterest? Seriously. While the internet has been a major boon to party planning, pinterest has helped us all up our game, and in my case doing so at the very last minute. Blue turned six last week, and he insisted on a Teenage Mutant Ninja Turtles party. We had two sets of grandparents visiting during the month so by the time I was done with all of that and ready to start thinking about the party I had only a week from start to over. I did what any time-crunched mama would do and created a new pin board. Inspired by a shirt I found, I created a freezer paper stencil (my favourite tutorial is from MADE) and made one of Michaelangelo for Blue to open on his birthday. He wore it for the party but posed in all the photos in a way that doesn’t show the shirt well. You’ll have to use your imagination and know that it was awesome. My husband insisted that the guest list be very small with this elaborate theme (while we typically do 1 guest per year of age and he’d have had a guest list of six, Paul made him keep it to four,) and with some communication snafus only half of the invitees arrived (although, we insisted that the younger siblings of one stay to beef up our numbers so it didn’t feel sad. What we had was a Ninja Training Camp. Before the party was over everyone had worn a different color. YES, I know that Rafael is the red TMNT, and yes, I did make two of his masks, and yes, they did get worn, just not in this photo. 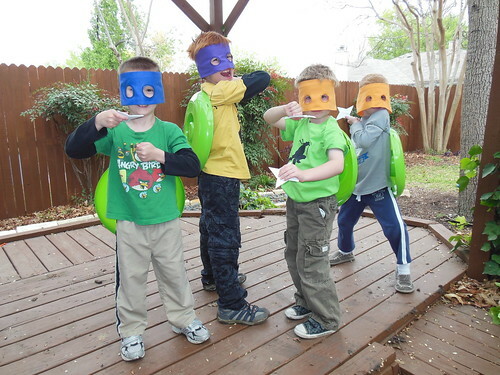 Each ninja was granted first a mask, in color of choice from the TMNT colors. (I had two of every color so there was room for changing minds.) I had purchased bandanas at Michael’s, cut them in half, sewn and cut out the eye holes, and ironed on velcro fastening. If I were to do it again I’d have cut the bandanas into thirds, they were a bit much for my liking once I saw them on the kids. However since I made them the day before the party I was pleased enough. Once we had ninjas we needed to mutate them to turtles. It took a couple of dollar stores to find what I wanted in the right color (and truth be told I preferred the shape of the blue and red ones for turtle-shell-ness but had to settle for the plainer shape because it was green,) but using a green chip and dip platter I created turtle shells. I simply drilled small holes in the sides and ran elastic through the holes for the children’s arms to slip through, backpack-style. 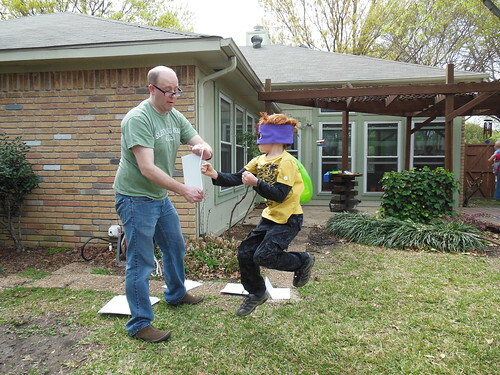 As they tested out the stars they made I passed out punch balloons so they could practice their fast-punching skills and we followed that with some limbo — not as easy as you would think with a shell on your back! Moving back indoors we made glow-in-the-dark ooze while the grown ups set out the food. For party favors the boys went home with the things they had worn and made (and broken): a mask and shell, the paper throwing star, the punch balloon, the broken boards, and the glow-in-the-dark ooze. My own kids used their ooze as a nightlight. As for me, I was too tired to need a nightlight, but happy that the party had been a success, having done approximately half of the things I had pinned.